Opera Company of Philadelphia’s production of Verdi’s “Otello” at the Academy of Music does its best to bring one of the clunkiest warhorses up to trot, but even with robust orchestration by conductor Corrado Rovaris, OCP couldn’t escape its many musical cul de sacs. Arrigo Boito’s libretto, highly regarded but without any of Shakespeare’s irony or poetry, just wheezes on over four acts. But, one thing this Otello can boast is the triumphant performance by baritone Mark Delavan as Iago, the plotter to the rescue. 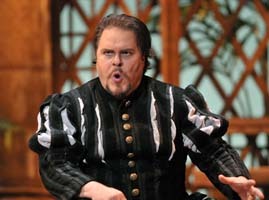 Sunday’s performance starred tenor Allan Glassman as Otello (all other performances star Clifton Forbis). Glassman, a powerful tenor, had trouble with occasional cracked and evaporated notes, but the bigger problem was that this Moor is a crashing bore without any musical dimension. Soprano Norah Amsellem fares better as Desdemona, even in overacted scenes when Otello accuses her of infidelity. Her mugging is this side of sketch comedy. Amsellem is best solo; during the climactic Willow Song bedroom scene, she balances both emotional expressiveness and vocal consistency just in time. Throughout Delavan’s Iago is both subtle and broad, cunning and witty, as he manipulates Otello into paranoiac rages. Delavan, a baritone, has incredible vocal silkiness in mixed ranges, all used to great effectiveness as the scheming Iago. He owns this part. Just before opening, Delavan tore his meniscus, but performed the opening in a wheelchair and at Sunday’s performance, simply used a cane as a rhetorical weapon. Margaret Mezzaccappa, a mezzo-soprano currently at the Academy of Vocal Arts, makes an impressive debut as Desdemona’s chambermaid Emilia. Her part is completely underwritten, but she makes the most of it vocally. Also strong in otherwise sketchy parts are Jason Collins as the framed officer, Cassio, and Cody Austin as the court gentleman Roderigo. Rovaris impressively detangled scenes of overlapping dialogue with muscular tempos and crystallized orchestral phrasing. OCP stage director Robert Driver makes this a pretty straightforward period spectacle, without much movement and the chorus mostly skirting Paul Shortt’s bulky sets (I loved the gilted textures of the palace hall, though). Meanwhile, the 65-plus-member chorus proved vibrant, filling the Academy mightily to override otherwise limp background material.